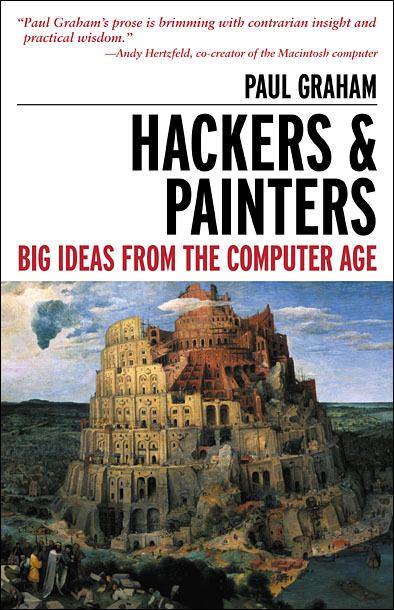 I finished reading Hackers and Painters: Big ideas from the Computer Age by Paul Graham the other day. This book was suggested to me by Henk Jan Pluim (very nice guy), and I really enjoyed reading it. It’s nice short book, with very strong opinions about pretty much anything, including politics, popularity, economics, statistics and, of course, programming. For me, one of the most interesting parts of the book is that the author asserts that one of the key competitive advantages when running Viaweb was that they were programming in Lisp. He goes even further, by stating that “Lisp is the most powerful language available”. The argument goes that it’s a fact that some languages are more powerful than others (due to the fact that they vary in abstractness: c is more powerful than asm), but you can only see that another language is less powerful when you actually know the more powerful language. At the top of the chain is Lisp, since apparently its macros let you do things that are extremely powerful, yet not any other language contains a feature that is at all comparable. Now I’m not entirely sure if that reasoning is entirely sound: the whole point of language wars is comparing your language to another language and arguing the other language is less powerful due to it missing certain features. I currently take the position that in business (web) apps, you can probably solve similar problems in the same amount of effort and with the same amount of elegance in C#/F#/Ruby/Python/Scala/PHP/Java/Go/Clojure or any of the other currently popular high level languages for that kind of work. Nonetheless, I don’t want to dismiss the idea that there can be unknown unknowns that might significantly shift my thinking. Maybe Lisp-style macros is one of them, so I’ll definitely put in some effort to learn more about them.